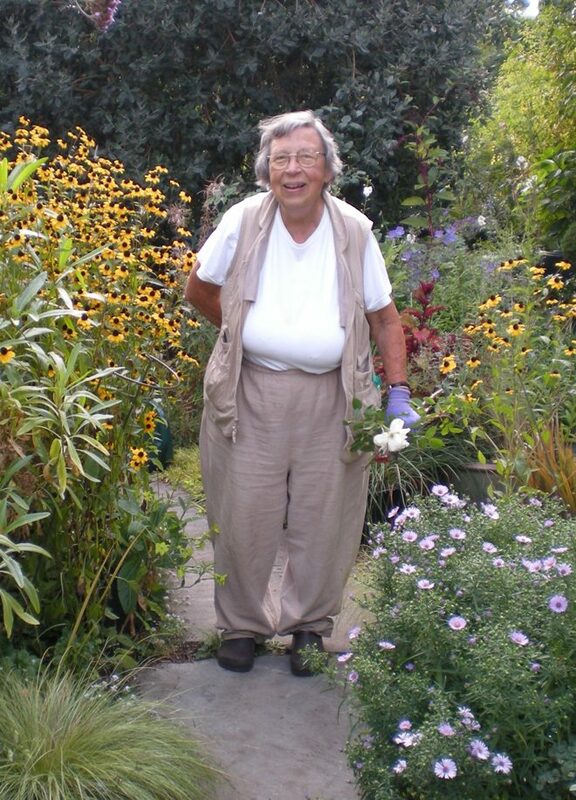 Barbara Worl, eminent practitioner of gardening—that most ephemeral of arts—died on September 12, 2017, at age 90. Born in Indiana, she made her home in California after graduating in 1950 with a degree in English history from Stanford. With a small inheritance, she bought a house on a 100-foot by 100-foot lot in Menlo Park and began making her first garden. 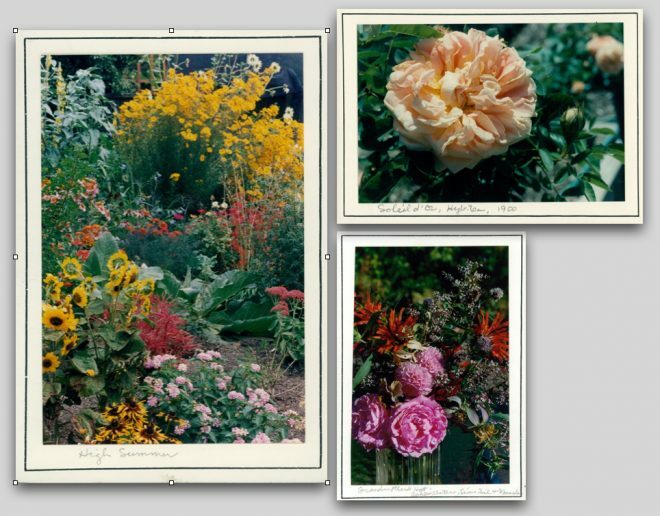 Over a 55-year career as a bookseller at Bell’s Books in Palo Alto, she built up a superb gardening book section and befriended gardeners and old rose lovers around the world. One has the whole year to look forward to the next flowering, and the wait builds character. For 20 years, Barbara gardened at Cowper Street after working all day at Bell’s Books. 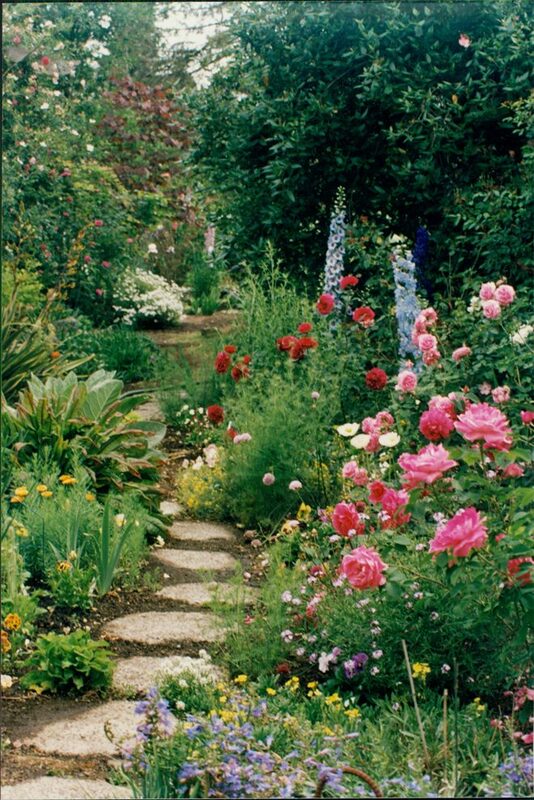 I visited just once, on one of Barbara’s open garden days, and was bewitched. I remember a wild exuberance of plants, enormous mounds of tea and Bourbon roses, and the single white banksia flinging itself high up into an ancient live oak. The place was enchanting. 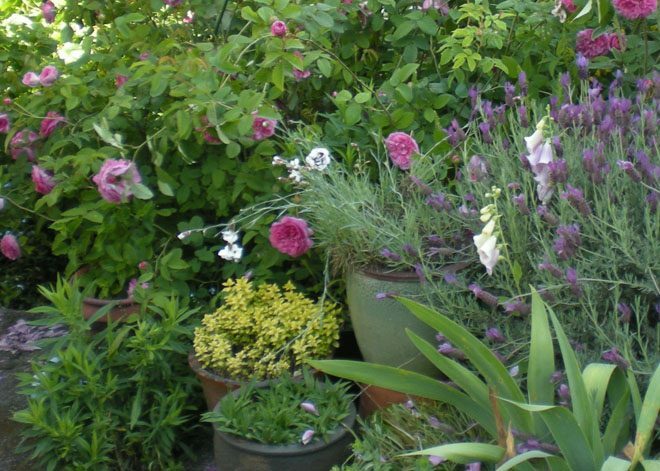 Barbara’s way of planting—her tremendous freedom and sense of play, her unfettered delight in exuberance and abundance—radically changed my ideas of what a garden could be. But it was the final garden around her home that I knew best. She made it with the help of Janet Eldridge and Ron DeBord when the Cowper property was sold. I saw it in its infancy and watched it mature. I witnessed the progression of bloom through the seasons. In spring, the crabapple and tulips, the dogwood and weeping Japanese cherry, began the enchantment. 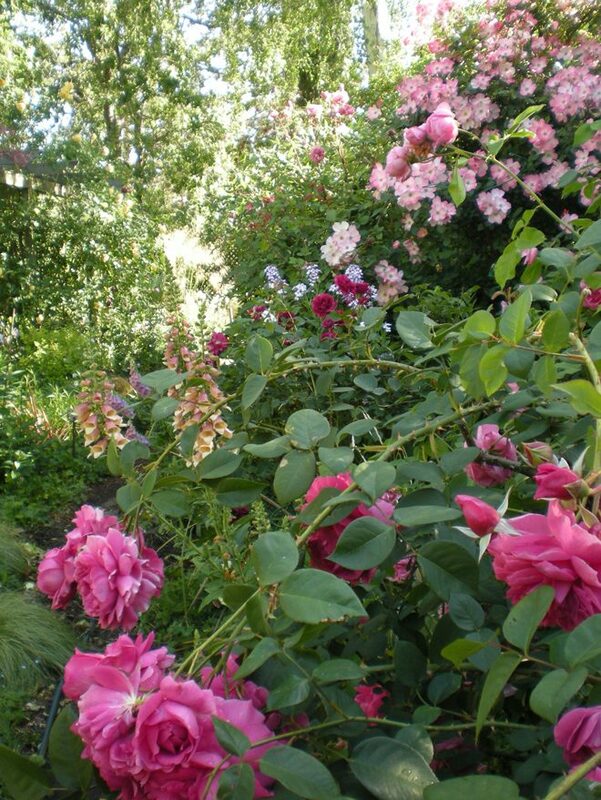 By April, the roses ‘François Juranville’, ‘Buff Beauty’, ‘Pink Mermaid’, ‘Rêve d’Or’, ‘Graham Thomas’, and ‘Reine des Violettes’ were romping up the 70-foot pergola facing the street. In summer, the back meadow garden came alive. Asters, salvias, sunflowers, black-eyed Susans, goldenrod, verbascums, dahlias, and roses danced and swayed in a riot of color. Fall brought fruit. The old guava and ‘Hachiya’ persimmon gave of their bounty and Barbara filled buckets for all her neighbors. In October, we counted the pomegranates suspended from branches over the fountain in front of the house. The scent of wintersweet heralded winter. And so I began stopping by the garden at least once a week. How many times over the years we just wandered round it, scarcely speaking but stopping often to admire some bloom or combination of plants. And as we circled the house, Barbara would be gently snapping off dead flowers, clipping roses for a bouquet, or tying up ‘Soleil d’Or’, the Pernet-Ducher rose from before 1898, which she adored. Time stood still for us in the garden. As I write this in November, little parcels of Barbara’s last plant orders are arriving at Bell’s Books just as they have for more than 60 years. 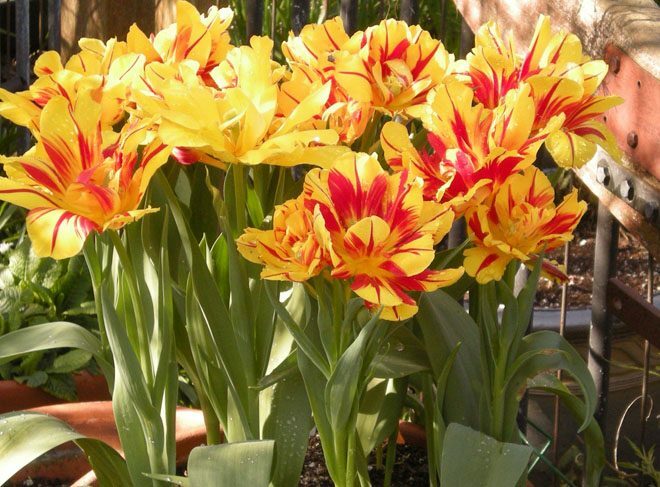 The packages are filled with daffodil and tulip bulbs—new varieties, no doubt, which Barbara just had to try. How strange it is that she will not be giving them homes on the path that long ago replaced her driveway. The day before she died, Barbara whispered to me, “My time in the garden is over.” Her life was one long, joyous love affair—with gardens and garden makers, with plants and roses, with her dear neighbors, with her Indiana family and the Bell family, with the cats who sunned themselves on the paths, and with the songbirds who swooped and chirped all through the garden. 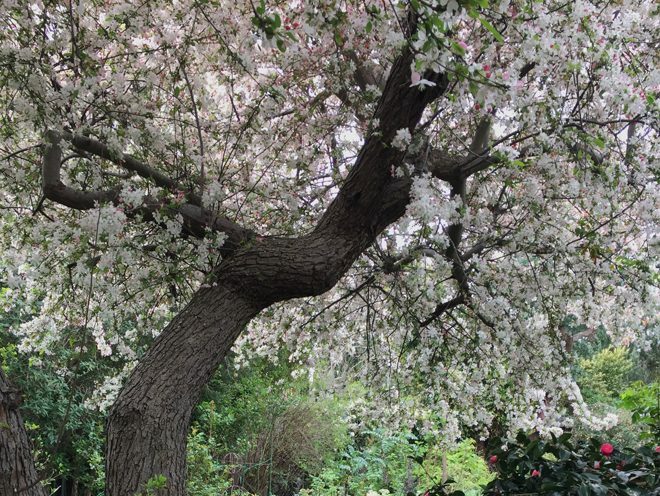 Garden snapshots by Barbara Worl. Barbara loved and was much loved. She opened her Quaker heart to all manner of living creatures, including people. Her friendships were lifelong. She once said that not a day went by that she didn’t miss Israel Harris, her beloved husband of 38 years, and Herbert Bell, who hired her to work at Bell’s Books. She may have corresponded with the likes of England’s Graham Stuart Thomas and the Marchioness of Salisbury, but she welcomed all and sundry to her garden. Nothing pleased her more than sharing it. 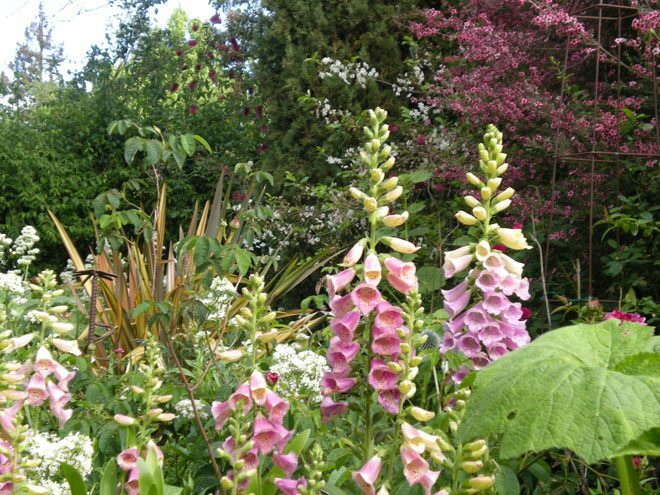 Barbara once heard organic pioneer Alan Chadwick say that the ultimate art of the gardener was to lead the eye onward and upward, culminating in a vision—the gardener’s Eden. “It is not always possible to achieve the vision,” she wrote, “but we can strive for it.” Even in the last month of her life she could be found watering the garden or sitting under the crabapple, chopping up birch twigs to strew on the paths. Barbara enriched my world and I was blessed to know her. Author Virginia Kean wishes to thank Faith Bell for all her help and for access to Barbara’s papers and photo archives.